It seems a bold move to release The Death of Louis XIV deep in the heart of the summer blockbuster season. Albert Serra's film is sombre and studied as it creates a painstaking portrait of the agonising final days of the Sun King. Based on medical records and the memoirs of the Duke of Saint-Simon and other courtiers, the film strives for an unimpeachable authenticity in its depiction of Louis XIV (Jean-Pierre Léaud) and those who attend an absolute monarch. It achieves a rigour that would make it a perfect companion piece to Roberto Rossellini's similarly serious-minded 1966 feature The Rise of Louis XIV. Louis is the sun around whom everything revolves. 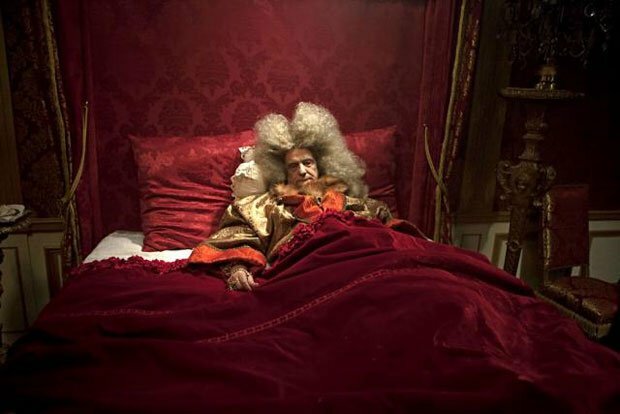 In 1715, after more than 70 years on the throne, the King begins to suffer acute pains in his left leg and is confined to bed. Royal obligations continue as doctors desperately seek a remedy. Diet is changed, a course of bleeding is undertaken and goats' milk is prescribed but, as gangrene sets in and the leg turns black, it becomes apparent that the situation is hopeless. The King prepares to die and the whole film becomes the equivalent of maintaining a respectful bedside vigil. Cinematographer Jonathan Ricquebourg gives proceedings the look of a Hogarth painting, as candles provide the only points of light in a life that retreats into the treacly darkness of the Royal chambers. Nouvelle Vague veteran Léaud has his best role in ages as Louis. Surrounded by a spectacular halo of fizzy grey hair, he exudes a weary indomitability, determined to carry on regardless of his suffering. The tiny details of discomfort, faraway looks and bursts of frantic concentration convey the torment of a great force fading away in a film that is uncompromising, challenging and deeply felt. Limited release from Fri 14 Jul. King Louis XIV begins to die, surrounded by loyal followers in the royal chambers. The tiny details of discomfort, faraway looks and bursts of frantic concentration convey the torment of a great force fading away in a film that is uncompromising, challenging and deeply felt.